Custom window replacement can enhance the beauty and elegance of your home, while also improving security and energy-efficiency, and reducing noise and draftiness. E & M Remodeling is proud offer replacement windows. Choose from our wide selection; from Bays, bows, double-hung, casements, single and double sliders, sliding glass doors, skylights, and geometric shapes. All windows include high performance insulated glass to help save energy and make your home more comfortable. We offer Millgard and FourSeasons windows. Our windows are all Energy Star qualified. They have been recognized by the U.S. Department of Energy and the U.S. Environmental Protection Agency as energy-efficient products that promote environmental and economic benefits for consumers. Read about the American Recovery and Reinvestment Act of 2009 and how your new windows can earn you a tax credit of $1,500 AND save you money on your monthly energy bills! What are the advantages to Custom Replacement Windows? Custom fit replacement windows are guaranteed to fit properly to reduce draftiness, outside noise, and the likelihood of leaking in the future. Additionally, custom windows allow you the option of a variety of different shapes, styles and designs for each room in your home. We also offer skylights in standard and custom-fit sizes. Vinyl windows: Vinyl windows provide many benefits that wood and aluminum windows do not. Vinyl is a durable material, which means less maintenance and longer lasting beauty. When installed, vinyl windows do not require painting. Wood windows: Many consider wood windows to be the most visually appealing. The natural beauty of wood is difficult to reproduce. They are often chosen for their strength, ability to be painted or stained, and their insulating qualities. Wood will not conduct heat or cold as easily, thereby providing good insulation against hot summer or cold winter days. Vinyl, Aluminum, or Wood Clad windows: These windows offer homeowners the option of having the benefits of one kind of window (such as the durability of vinyl or the natural beauty of wood) with the appearance of another. The window will can be made out of the product of your choice, but will be capped with a finish that appears to be another product. What are the features that E & M Remodeling can offer on custom window replacements? How easy it is to replace or install new skylights in my home? E & M Remodeling offers a variety of skylights, in standard and custom sizes, to fit your home’s needs. Skylight installation is an easy way to increase the lighting and ambiance in any room of your home. Ask one of our Project Consultants about options for skylight installation! E & M Remodeling is one of the leading replacement windows companies in the Dallas, Salem, Corvallis, and Albany areas. With tons of experience under our belt, our sales associates and window installers are the best in the business. From traditional replacement windows to energy-efficient windows to custom window installation, E & M Remodeling is regarded as one of the top window contractors. Please Contact us for a Free Estimate on replacement windows or new window installation! We look forward to working with you! Most homeowners contact our company because they want to replace sliding glass doors or front entry doors. These doors typically get the most use, and therefore are most frequently in need of replacement. Like many of our customers, you may be considering an upgrade to your sliding glass doors because you want to improve the quality of the unit…many home builders will use lower quality sliding glass doors during the original construction of a home. Because of the unique gliding motion, there is a higher potential for mechanical failure with these types of doors. Many front entry doors also feel the wear-and-tear of everyday use, but a new front entry door can make a big impact on the curb appeal of your home. We are proud installers of Peachtree fiberglass and steel doors, as well as a variety of other beautiful, energy-efficient options. Contact us today to schedule your free estimate! What options do I have when replacing my doors? 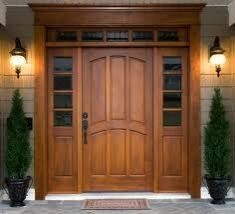 E & M Remodeling has industry experience with the installation and replacement of exterior doors and glass sliders. Contact us today by contacting us for a Free estimate.